Weighty Matters: The Heart and Stroke Foundation Needs Remedial Math! The Heart and Stroke Foundation Needs Remedial Math! You know, the fact that I think the Health Check program is nutritionally bereft and a national disgrace is debatable for some and indeed there are folks out there who disagree with me and think Health Check's great. I think they're wrong of course (and so too does nutritional evidence) and certainly I've posted plenty on why Health Check stinks in the past. Of course even the folks who disagree with me the most aren't going to be able to squirm their way out of acknowledging that math is certainly not Health Check's strong point. 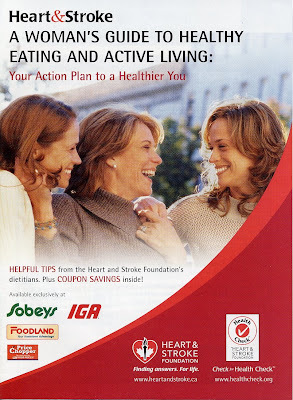 Today I'd like to look at a page I've scanned in from Health Check's recent publication, "A Woman's Guide to Healthy Eating and Active Living" that my wonderful wife picked up for me at Sobey's. "Choosing leaner beef is part of healthy eating"
"Beef, Goodness in Every Bite"
"Eating well is easy by adding lean beef to your busy mealtimes"
Now let's put aside the fact that eating beef is certainly NOT a part of healthy eating (for more information click on the Beef tag at the end of this post to see my various concerns regarding beef). Instead I want to focus on lean ground beef. Following the Food Guide and eating Health Check'ed-dietitian-approved lean ground beef women are allowed 150 grams a day and men, 225 grams a day. Lean ground beef in Canada by definition is 17% fat (extra lean is 10%). 17% of a woman's 150 gram allotment = 25.5 grams of fat. 17% of a man's 225 grams = 38.25 grams of fat. However, 229.5 calories divided by the recommended 600 total daily fat calories = 38% of the recommended daily intake of fat, while 344.25 calories divided by the recommended 600 total daily fat calories = 57% of recommended daily intake of fat! So in case you didn't follow all of that the end result is that if you choose the Health Check'ed lean ground beef that Heart and Stroke Dietitians say, "is part of healthy eating" and you even actually restrict your portion to those recommended by the Food Guide (and let me tell you, that's not a ton of meat), then in that single serving if you're a woman you'll be consuming 38% of your total daily recommended intake of fat and if you're a man 57%. That sure sounds like a lot. 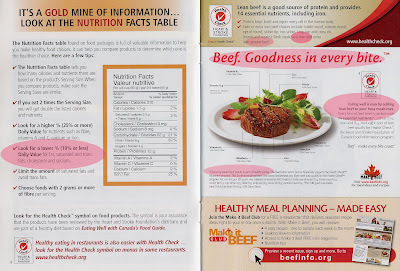 Apparently that's even a lot for the Heart and Stroke Foundation given that highlighted on the left hand side of the page is there admonishment not to consume foods containing more than 10% of your total daily recommended value of fat. So here we have the left hand telling us no more than 10% and the right hand telling us 38%-57% is just dandy. Any of my readers grade school math teachers that want to do a good deed? Maybe you can give the HSF a call and offer your help.